The Best Synthesizer Youtube Channels from thousands of Synthesizer Youtube Channels in our index using search and social metrics. We’ve carefully selected these youtubers because they are actively working to educate, inspire, and empower their audience with frequent updates and high-quality videos. About Youtuber Hi, I'm Paolo and this channel is about the passion of my life: music. Here you can find original music, video tutorials, and reviews of synthesizer and other keyboards, effects, and a lot more. About Youtuber RetroSound reveals the secrets of electronic music of the 70s and 80s featuring the legendary sound of vintage synthesizers and drum machines of that time. Founder Marko Ettlich create the RetroSound project for sound-design in 1998. RetroSound developed several sound-sets for synthesizers. About Youtuber Here is your source for analog synthesizer demonstrations, information, and music by Marc Doty. About Youtuber Welcome to Bobeats! I make video about music production, synthesizers and creativity! About Youtuber mylarmelodies is a channel by hand based synthesiser specialist. Enjoy 80's electro and understated melodies that make the skin slide off your face. About Youtuber We design and build Analog Modular Musical Synthesizers. About Youtuber Colin Benders is a Musician & Composer who works with Modular Synthesizers. You will find a lot of music on this channel, with regular livestreams exploring the possibilities of this wonderful instrument. About Youtuber Live ambient electronica, space music, synth jams and demos for synthesizer lovers worldwide. Global ambient artist synth4ever performs and improvises all instrumental music live, directly on hardware synthesizers. About Youtuber matrixsynth synthesizer channel is dedicated to everything synth, eurorack, modular, electronic music, and more. About Youtuber Synth Anatomy is a music technology channel based in Vienna (Austria) which has its focus mainly on hardware and software which are strongly related to electronic music production. My aim is to inform musicians about the new available music technologies available. I cover music trade shows, published tutorials, interview musicians & developers, review in depth synthesizers, drum machines, music software and more. About Youtuber Hi, my name is Bryan Noll and I make music as Lightbath. My primary instrument is the modular synthesizer, but I also play other synthesizers, guitar, and a few other things. About Youtuber Bonedo Synthesizer is your resource for Synthesizer Video Demos focussing on what really matters - The Sound. No talking just pure signals. About Youtuber Videos from Synthtopia.com, a portal for news and information about synthesizers and the world of electronic music. About Youtuber Erica Synths is a channel dedicated to Synthesizers. About Youtuber Tutorials and Reviews for the Synthesizer Do-It-Yourself enthusiast. About Youtuber Official channel for Pittsburgh Modular Synthesizers offers informative videos on synthesizers. About Youtuber riamiwovideos is a channel by a Synthesizer Nerd and Producer/DJ based in Germany. It offers a new StudioVlog, HowTo's and Synthgear testing. About Youtuber LESINDES is dedicated to MUSIC for the moment it happens to be mostly synthesizers in action and studio gear that is being tested. About Youtuber Synthrotek is an electronic circuit design business specializing in lofi, DIY and Analog noise making and synth kits. About Youtuber This channel is dedicated for synthesizer tests. Since not so long I`m putting here also my other works in the form of sampled beats and other musical pieces. About Youtuber Tutorials and demos on synthesizer and drum machine repair. About Youtuber Nu-Trix has been creating electronic music since the 90's. He's been working at the school Musitechnic in Montreal since 1995. He just love to share knowledge and tips on electronic music making! About Youtuber Find videos on Modular Synthesizer Music, Polyphone Modular Synthesizer, Vintage Analog Synthesizer and Guitar & Guitar Synthesizer. About Youtuber Synths, tech, electronica and geekery. New gear, setup guides, live jams, original music, repairs & builds, music technology reviews, tutorials, retro gaming & computing! About Youtuber Just video blog stuff discussing mostly synths, progressive rock, music in general, recording music, music recording gear, music recording software and music producing gear. About Youtuber Welcome to Mark Mosher Music. I’m an electronic musician, synthesist, and multimedia performer. About Youtuber Moogulator offers news, information and updates about sequencers, synths & DAWs. About Youtuber Synthesizer Video Service provides extensive informative and detailed videos on Synthesizers. About Youtuber Home to the Patch of The Week modular synthesizer tutorial series and Doug Lynner's live modular analog synthesizer performances. About Youtuber Raw and uncut, unstructured and improvised, hardware-only synthesizer jams from Mr. Tuna and Friends. About Youtuber Thonk Synth DIY bring you modular synthesiser DIY kits and accessories. About Youtuber Modular synthesizer pieces performed 'live' with no dubs or editing. I'm a Danish composer, producer, song-writer, classically trained pianist and synthesizer-addict based in Copenhagen. About Youtuber I am Blaise, founder of Synthmorph. I release soundsets for synthesizers that are the symbiosis of unique MIDI sequences and related synth presets with matching parameter set constituting a morphing, expressive sound together. About Youtuber Synth Expert is a part of the Production Expert family, a place for those who love synths. About Youtuber Peter Grenader's Youtube Channel is Electro-Acoustic Research founded & designs modular music synthesizers. About Youtuber My home is a Synthesizer Home! Modest and short demos/videos of vintage electronic instruments and factory demos of synthesizers and drum machines. About Youtuber Mostly videos of me freaking around with my synthesizers in my studio under the name of Wayne Brave. I like electronic music and devices which produce it. About Youtuber Fragment is a web-based collaborative additive/granular/spectral musical instrument software driven by real-time visuals generated by its users from shared GLSL scripts. About Youtuber Cables For Clouds are a two piece modular synth duo that will put a little fire in your pants. We make Eurorack and modular synthesizer videos for youtube. Mostly eurorack jams/analog synth equipment used. It has been a real inspiration to our studio and decided to make videos of jazzy style free play spontaneous eurorack modular jams. About Youtuber Control is a synthesizer brick/mortar & online retail shop located in the South Williamsburg Neighborhood of Brooklyn, NY. We specialize in Eurorack Modular, vintage traditional and unusual eccentric electronic devices both analog and digital. 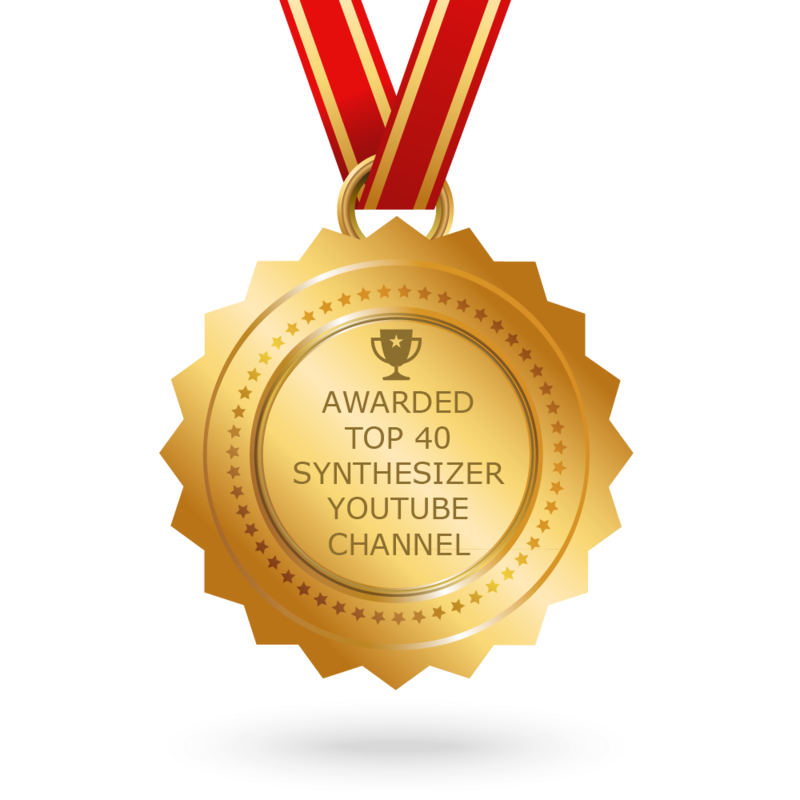 CONGRATULATIONS to every youtuber that has made this Top Synthesizer Youtube Channels list! This is the most comprehensive list of best Synthesizer Youtube Channels on the internet and I’m honoured to have you as part of this! I personally give you a high-five and want to thank you for your contribution to this world.